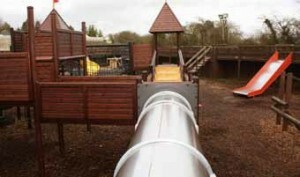 completed a substantial refurbishment of a 7-tower HAGS SMP play unit at Sundown Adventureland. The outdoor play area at Sundown Adventureland in Nottinghamshire has recently been transformed into a state-of-the- art play zone, with help from RSS Playground Inspection and Maintenance. An independent inspection of the play unit identified significant timber decay, leaking from roofs and rusting of metal components. The park’s owners faced an estimated replacement cost of £200,000, but RSS stepped to provide a more cost effective solution. RSS undertook a full site survey identifying all the defective items and proposed a full refurbishment. The fixed price for the complete refurbishment totalled £76,000, a little over a third of the cost of a replacement unit and took around four months to complete.